Seasonal affective disorder, often shortened to SAD, is a subset of major depression recognized in the Diagnostic and Statistical Manual of Mental Disorders, 5th Edition (DSM-5), which begins and ends at the same time every year. 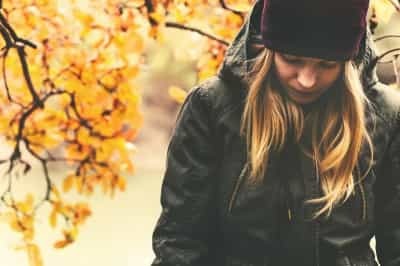 This cyclical type of depression most commonly affects people in the fall and winter, and eases in the summer as days get longer; however, a less common form of SAD gets worse during the spring and summer. Although many people get the “winter blues,” mild sadness or restlessness during the winter, this is not the same as SAD. While symptoms of this kind of depression ease for some of the year, the DSM-5 requires a person to experience SAD symptoms for at least two years in a row, beginning and ending near the same time, and for symptoms to disrupt normal life and mental health. Major depression, the category to which SAD belongs, is a consistent sense of hopelessness or despair, leading to appetite changes, a decrease in physical energy, intense fatigue, insomnia or hypersomnia, restlessness, feeling worthless or hopeless, and thoughts of suicide. Major depression is correlated with substance abuse, as those who struggle with depression attempt to self-medicate their symptoms. People with SAD experience these symptoms for a specific number of months each year, although they may struggle with substance abuse throughout the year to compensate for changes in mental health. The first studies on seasonal affective disorder confirmed the condition affected thousands across the US in the 1980s, and the diagnosis has been refined since then. Like other kinds of depression, the underlying cause of SAD is unknown, although there are some factors that can trigger the condition. Living in a high latitude, close to either pole, where winter days are very short and summer days are very long, changes circadian rhythms to the point that mental health is affected. Changes in sunlight during some of the year may affect serotonin levels in the brain. Serotonin is closely linked to mood, and low serotonin levels are linked to depression. Also, changes in circadian rhythm may change the body’s natural production of melatonin, which also affects mood; the hormone also regulates sleep, and irregular sleep cycles can lead to mood disorders. Statistically, seasonal affective disorder is more common in countries like Canada and Sweden than in equatorial countries, and it is more common in states like Washington and Utah than Florida or Texas. Additionally, people who have family members with SAD are more likely to develop the condition due to a combination of genetics and environment. Women are more likely to be diagnosed with SAD than men, and young people are more likely to receive a diagnosis for this condition. Symptoms of SAD are similar to other mental health conditions, like bipolar disorder or other kinds of depression; they also mimic symptoms of hypothyroidism and mononucleosis. It is important to consult a doctor to diagnose and treat SAD in order to receive the right treatment for the correct condition. How Common Is Seasonal Affective Disorder? Seasonal affective disorder disrupts lives all over the world. In the US, an estimated 10 million people, or about 6 percent of the general population, struggle with this mood disorder every year; however, states at higher latitudes, like New Hampshire and Alaska, have rates of 10 percent or more. Utah has found a rate of SAD at about 10 percent of the state’s population. Symptoms are likely to begin around 20 years old and ease after the age of 50. While 10-20 percent of cases are mild, 6 percent of people with SAD have been hospitalized for the condition. About 55 percent of people with SAD have a family member with a depressive condition while 34 percent have a family member with a substance use disorder. SAD SAD is rare in anyone under the age of 20, but this is likely because children do not experience full depressive episodes and instead show other symptoms of mood disorders. In Minnesota, about 5 percent of children have diagnosable SAD. Canada reports 2-3 percent of their general population has SAD, and about 15 percent experience milder symptoms. A survey in Denmark looking at 185,419 cases of severe depression from 1995 to 2012 found that with the time change between winter and summer, 11 percent of study participants experienced increased symptoms after the transition out of daylight savings time; the symptoms dissipated after 10 weeks. Mood disorders in general are highly correlated to substance abuse. Addiction may lead to brain changes that induce a mood disorder, or substance abuse may develop because a person struggling with a mood disorder is attempting to ease their mental condition. The National Institute on Drug Abuse (NIDA) found that people with mood disorders are twice as likely as the general population to struggle with addiction, and vice versa. Seasonal affective disorder is particularly associated with problem drinking. An older study found alcohol use disorder was correlated with lower levels of serotonin in the brain, likely due to SAD; this increased drinking during the winter months. Since alcohol is fermented fruit or grain, the link to carbohydrate cravings and alcohol consumption may put a person with SAD at risk for developing problem drinking. However, stimulant ingestion may increase among those struggling with winter-based SAD, as an old study on cocaine and SAD found. People who are in recovery from substance abuse may develop seasonal affective disorder, which could trigger relapse. In addition, people who are prone to SAD who move into a part of the world with greater fluctuations in daylight through the year may develop SAD, which could trigger a substance abuse problem. Light box therapy: Prescription versions of light-boxes radiate daylight-like light, which includes UV spectrum rays. The doctor will prescribe sitting with the box a specific distance away for a certain number of hours, so the skin, eyes, and brain can absorb extra light when it does not occur naturally. Dawn simulation: Because dawn occurs irregularly in higher latitudes, a light that turns on during sleep and gradually becomes brighter can help a person adjust to dawn occurring later in the morning during winter, or a combination of dawn simulation and blackout curtains can help a person adjust to a much earlier dawn during the summer. A physician or therapist may also prescribe selective serotonin re-uptake inhibitors (SSRIs) or other antidepressants. This can help regulate mood throughout the year, so symptoms of SAD are not as intense. Medications should be used in combination with therapy to understand triggers for symptoms, change behaviors, and reduce the risk of future episodes of depression. Additionally, eating healthier foods and getting regular exercise – especially outdoors – can ease symptoms. If symptoms include cravings for carbohydrates and weight gain, changing dietary habits will reduce these cravings or fill them with healthier options. Outdoor exercise means more exposure to natural light during daytime hours, and maintaining a healthier body can manage hormones, neurotransmitters, and digestion. Vitamin D is produced in the skin by getting enough daylight. When there is not enough daylight, taking vitamin D supplements, consuming fortified foods and drinks, using light therapy, or shifting one’s diet to include foods higher in vitamins and minerals can ease this problem. Light therapy, antidepressants, healthy eating, and exercise can all be incorporated into addiction treatment. First, detoxing safely with the help of a medical professional will end the body’s dependence on drugs or alcohol. Then, entering a rehabilitation program that understands co-occurring disorders like seasonal affective disorder and addiction will get a person the therapy they need to live a healthy life.